Sometimes I have thought that the church looks more like a psychiatric ward than a place of restoration. I am not trying to be a cynic. There is simply a lot of pain there and that makes sense. It should be a place we come to for healing. It can sometimes be hard when the people we are looking to for help bring us more harm. 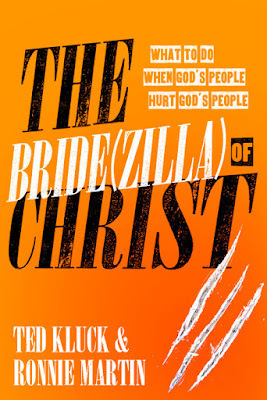 Sometimes we tend to look more like bridezilla than the bride of a gentle and loving God. That's what this book is about. It is about how the church can hurt you and the people you make yourself most vulnerable to can maim you. There were many great truths in these pages. It spoke of how the overflow of an ungrateful heart is consumerism. That leads congregations to dispose of staff like a commodity. Entitlement creates division. The struggles of ownership in the Corinthian church still continue today. Entitlement obscures our vision and our mission. One sentence reminded the reader that the only thing we are entitled to is wrath. There was quite a bit about forgiving those who have sinned grievously against us even when they are not sorry. "Mercy and forgiveness must be free and unmerited to the wrongdoer. If the wrongdoer has to merit it, it isn't mercy, but forgiveness always comes at a cost to the one granting the forgiveness." We want to feel safe at church and when that expectation isn't met, we must learn to forgive. There were many great and wonderful truths about unity in this book. The problem with two authors can be the two voices differ too much. I began to loathe reading Ted's sections because of his random bitter diatribes about Jon Acuff and Brene Brown. They were completely out of place and lacking in the gospel the rest of the book teaches. Other than that, it was excellent. 3.5 stars for lacking grace. This book was graciously provided by Multnomah Publishers for review.